For the final project in Mechanical Systems Design (ME112) each group was challenged to create a battery-powered bipedal robot, able to walk a distance of 1.5 meters at a minimum speed of 3 cm per second. 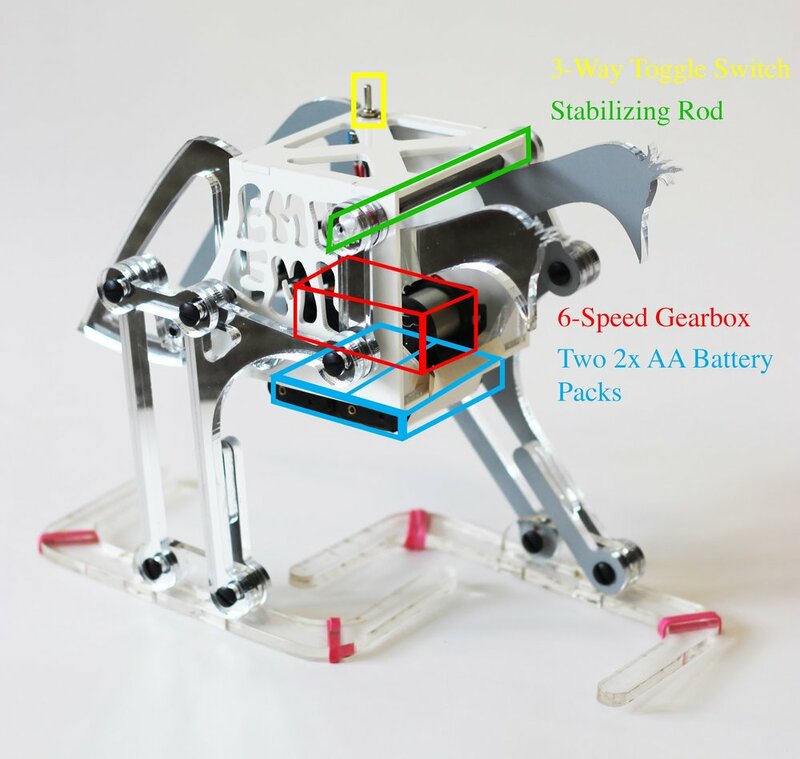 The robots were to be inspired by either a type of bird or dinosaur, and a design goal was to make the bipedal robot as biomimetic as possible while still being able to perform successfully during the final presentation. 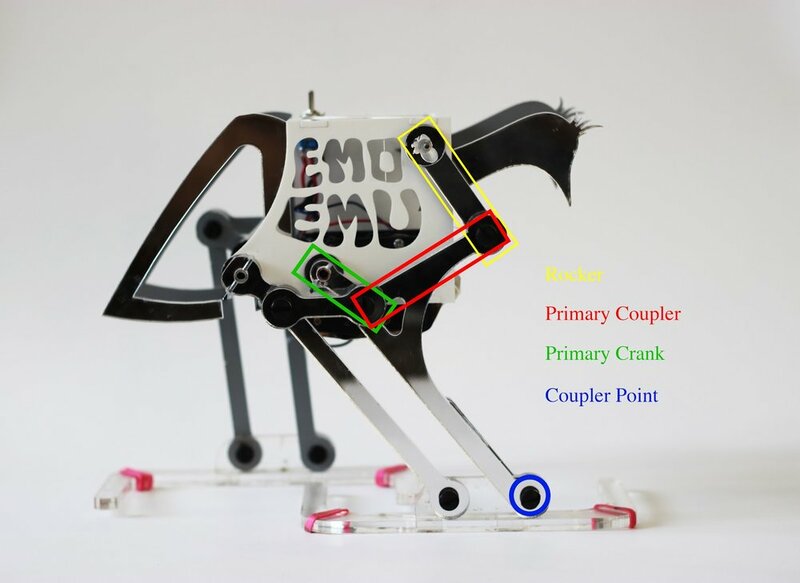 After preliminary research, our team decided to make a robot that emulated an emu. We believed that the emu’s large feet, smooth gate, and even weight distribution over the legs would help make our bird successful. To actuate the feet, we chose an “inverted knee” configuration that mimics the knee joint in a walking bird. Our linkage is an augmented four-bar mechanism with parallelograms that keep the feet level relative to the ground to improve balance. An initial iteration of Emo Emu experienced difficulty in walking smoothly and consistently. 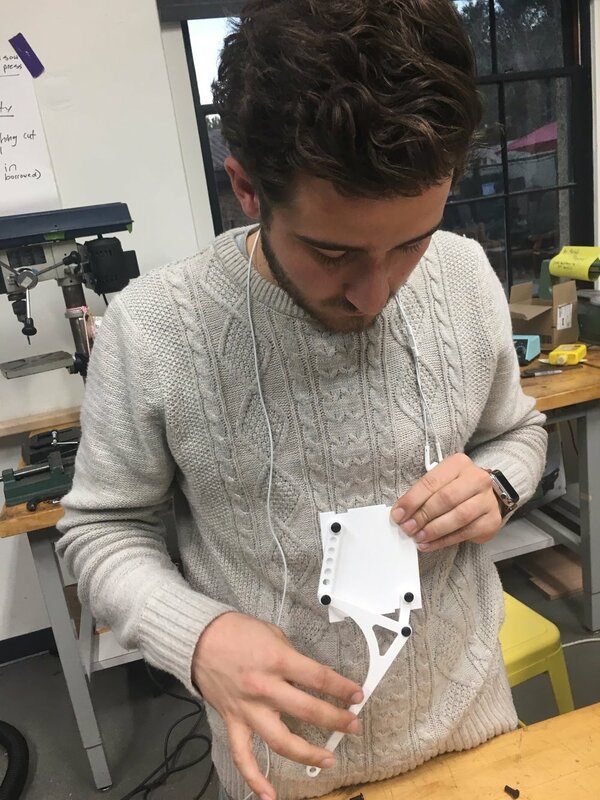 After receiving feedback during a design review, we realized we needed to reduce the amount of backlash and deflection in our linkage system and legs. We added steel tubing between various elements of the linkages and braced all connections. We also added a sprocket and chain system to ensure that all components of the parallelogram mechanism remained in phase. These changes allowed our bird to walk with an even and consistent gait at approximately 12 cm/s. We powered the mechanism using a Tamiya 6 speed gearbox with a 196.7:1 reduction ratio, operating at an efficiency of 62% on 3 volts, supplied by four AA batteries. 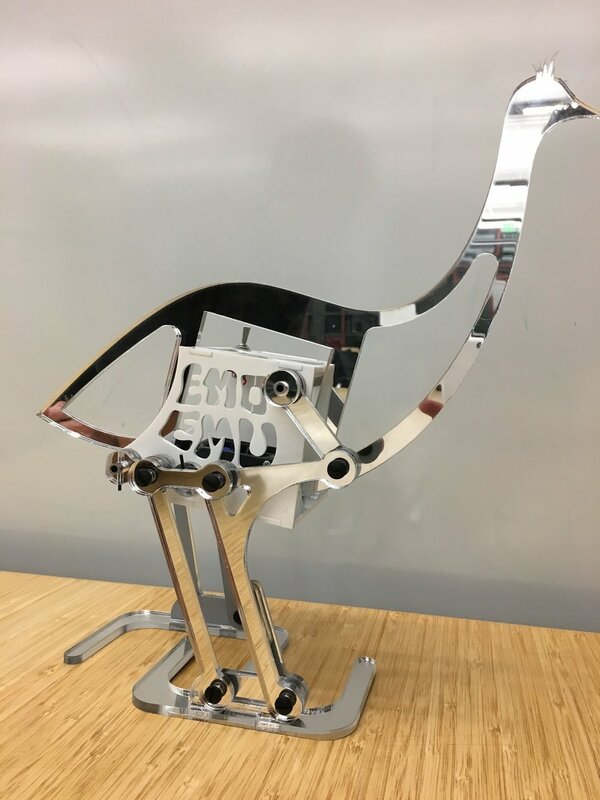 We also wrote a 43 page analytical report that explained our design and fabrication process as well as analyzed our bird's performance and motor efficiency. We were awarded the 2017 Hoefer Prize for Excellence in Undergraduate Writing for this report. We also received the award for most biomimetic robot. Still frames from a video of an early prototype exhibiting parallelogram collapse. Free body diagrams for two different views of the emu in mid-step. The center of mass is indicated by the checkered circle. Robot exhibiting balance on one foot. A metric that we defined would be key to success. Me, testing an early linkage system.